A lot of people knew the Space Shuttle had ceramic tiles to protect its nose from reentry heat. That’s mostly because the tiles fell off a lot and each one was a unique shape, so it got a lot of press coverage. However, you didn’t hear as much about the parts of the orbiter that got really hot: the forward part of the wings and the tip of the nose. For those, NASA used an exotic material called RCC or reinforced carbon-carbon. Other uses include missile nose cones and Formula One brakes. A similar material, carbon fiber-reinforced silicon carbide appears in some high-end car brakes. These materials can take high temperatures, easily. [AvE] wanted to make some carbon foam for experiments. It does take a little bread, though. Not money, but literal bread. 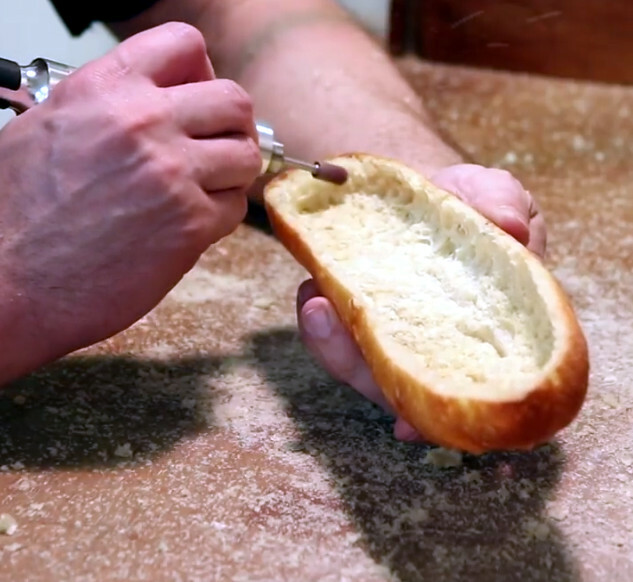 To create the foam, he burns bread slices in a chamber full of argon. The stuff has some amazing properties. In the video below, you can see the foam protecting a thermocouple from a torch flame and even holding melting aluminum. Not bad for a few pieces of bread. It’s not often we see a build that turns you into a better cook without any electronics whatsoever. [Chris]’s method of baking better bread with steam is one of those builds, and we’re more than willing to test it out on our own. If you’ve ever tried to bake bread at home, you’ll quickly notice the crust is much thicker and harder than a loaf available at a bakery. The thickness of the crust can be controlled, however, with a careful application of steam. To make a better crust, [Chris] used a pressure cooker fitted with a valve to inject steam into an oven through his oven’s exhaust. Not only does this gelatinate the starches in the bread crust, but it keeps this gelatin from hardening too quickly. The end result is a thin, golden brown crust that makes for the perfect loaf of bread. Of course, the proper application of steam does take a little bit of practice. If someone is up to the task of Arduinofying this hack with a few solenoid valves, PID sensors, and a high-temperature humidity sensor, send it in and we’ll put it up. [Mikey Sklar] wrote in to show us how he refurbished a neighbors useless refrigerator as a fermentation chamber. [Mikey] is a fan of making breads, kemchi, yogurt, and tempeh. To make these, it helps to have a completely controlled temperature for them to ferment in. [Mikey] developed a temp controller for this in the past, but had to either build a control box or use a giant chest freezer. This is not optimal for limited space, such as a kitchen. He got lucky when a neighbor tossed a wine cooler into the trash. These little coolers are perfectly sized for a kitchen and even have a glass front so you can keep an eye on what is going on inside without having to open it and effect your temps. [Mikey] ripped it open, replaced the peltier cooler with a large heat lamp and his temp controller. Since he was making yogurt with this one, he needed only to heat it. The final product turned out pretty effective.